Little People. 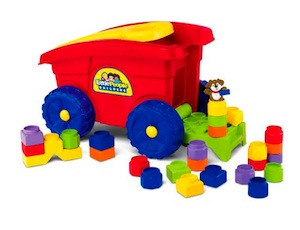 This wagon is loaded with build and play fun! Simple connections make it easy for little hands to stack, build and play with a pull-along wagon and over 25 building play pieces. Tailgate flips down to reveal a building surface and also allows easy access when putting blocks away. Rugged wheels make it easy to take-along indoors or out. And everything stores inside! Ages 1-4.